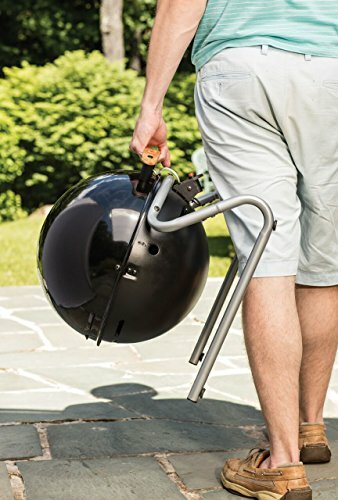 It’s been said that portable gas grills come in all shapes and sizes. 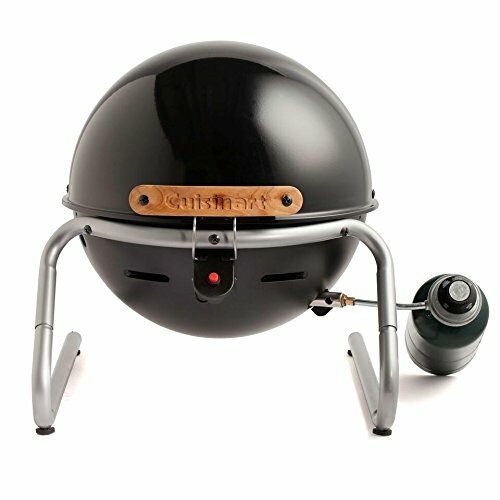 Cuisinart aims to prove that even a sphere can be on that list with their CGG-049 Searin’ Sphere. Cuisinart is a relative newcomer to the world of outdoor cooking appliances. Yet they bring their reputation for quality with them in all of their latest ventures. The “Searin’ Sphere” has a shape and sleek look that on its own will serve as a conversation starter. 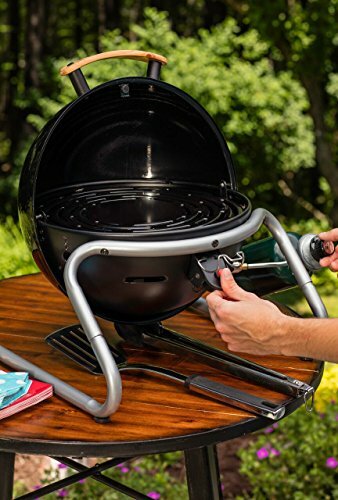 The fact that it only weighs 13 pounds and has a locking lid also means that you can use it as an on-the-go portable gas grill. The propane burner element has a push-button igniter and it produces 10,000 BTUs of heat. It comes set up to only run off of a 1-pound propane canister. However, you can purchase an accessory adaptor and hose to run it off of a larger propane tank. Cuisinart makes every effort to balance quality materials with a friendly price point. They do a pretty good job of this with the Searin’ Sphere. 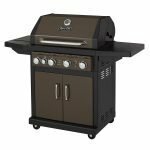 The porcelain coated grill grate is a step above most other portable grills in this price range. It also has a unique curvature to help the heat from the 10,000 BTU burner to circulate efficiently under the semi-spherical lid. When it comes to assembly, the Cuisinart Searin’ Sphere can be a little more work than you might expect. The igniter set up is particularly tricky, and as strange as it might sound, working inside a spherical shape can be awkward at times. With a little bit of patience and some nimble fingers, you should be able to fully assemble the Searin’ Sphere in 30 minutes to an hour. While there isn’t technically anything wrong with the one-pound propane canister set up, it feels a little bit like Cuisinart cut a corner. It also feels a little awkward just hanging there off the side. Considering the money that you are likely to have leftover, it might be worth it to purchase the adaptor hose and a small ten-pound propane tank. 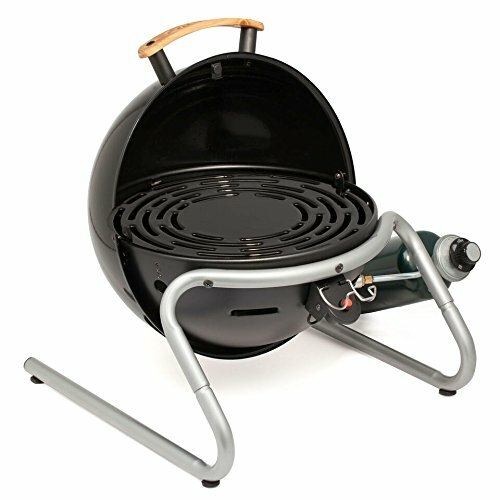 10,000 BTUs of heat is right on par or perhaps a little more than what you will find with most other portable grills. Most in the Searin’ Sphere’s price range produce between 6,500 to 10,000 BTUs. They also tend to have chronic issues with the wind blowing out the burner element. The shape of the Searin’ Sphere seems to reduce or even outright prevent this problem. This means with a solid 5 to 10-minute preheating, you can produce a nice sear on just about any type of meat. Yet you can also dial it down low and close the lid to slowly cook bone-in pieces of meat. The circular, vented shape of the grill grates also plays with the concave interior of the lid. 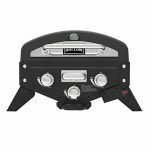 This means it is very heat efficient and lacks a lot of the hot and cold spots that you get with most other portable gas grills. 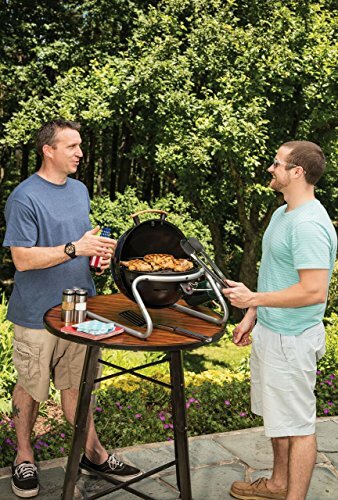 The 14-inch diameter grill grate provides just over 615 square inches of cooking space. This is enough room to make four or perhaps five large hamburger patties, without overcrowding them. With a little careful placement, it could even accommodate three servings of pork or lamb chops. The locking lid, paired with the lightweight 13-pound design, makes the Searin’ Sphere very portable. The domed lid and the concentric shape of the porcelain coated grill grates also help produce a more consistent heat with fewer hot and cold spots. The push button igniter might not seem like a big deal. Still, you won’t find this feature on other grills with a similar price tag. There isn’t a formal drip tray in the Cuisinart Searin’ Sphere. You can get around the awkward cleaning of the bottom portion of the fire bowl by first lining it with some heavy duty aluminum foil. If it ends up getting messy after a particular grilling session, you can just pull the aluminum foil out, throw it away and replace it. The porcelain coating on the grill grates is a nice touch and not something you typically find on a grill in this category. Cuisinart themselves even rate it as being dishwasher safe. Still, with all non-stick surfaces, the more time they spend in a dishwasher the more-sticky they are likely to become in the future. If the grill grates aren’t particularly messy, you might just want to give them a gentle scrape with a nylon coated grill brush. The Cuisinart Searin’ Sphere comes with an impressive three-year warranty. You would have to look high and low to find a warranty this long in a portable gas grill that costs less than $100. 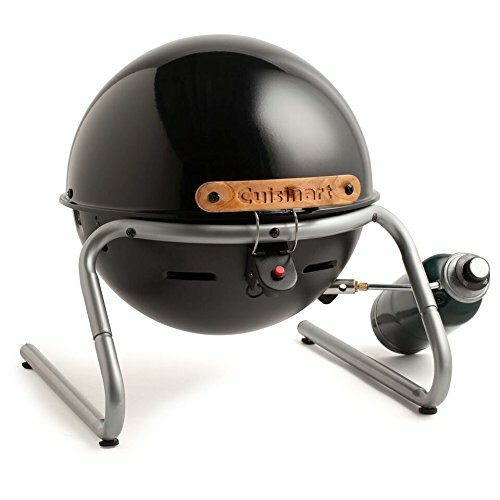 The Cuisinart Searin’ Sphere certainly has a lot to offer as a portable gas grill. 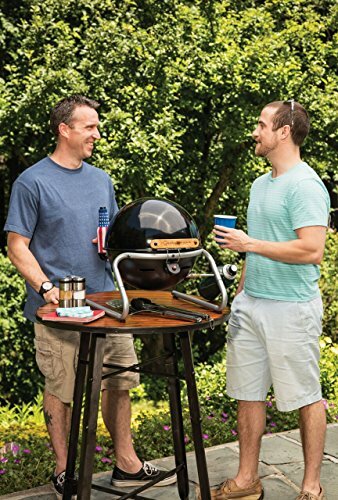 It blends lightweight, durable materials with the kind of interesting design that can serve as a conversation starter whether you are at base camp or in your own backyard. The tallness of the dome is also a nice touch and something that should catch your eye if you are a fan of beer can chicken. Considering that you get all this with a very friendly price point and a best in class warranty, it’s hard not to put the Searin’ Sphere at the top of your list. If you’ve got a few extra dollars laying around, you should consider investing in the propane hose adapter to work with larger tanks.